Well, perhaps my expectations on these are the problem here. When I saw the box, and the description on it, I got excited. Something different, and it appeared to be low carb (compared to everything else, mind you), so woot! But I didn’t read the box carefully enough. If I had, I would have realized that 4 servings in this box would mean each serving was small. One pupusa per serving. So, no, it’s not a standalone meal. My bad. What is a pupusa, you ask? Well, it was my first time, and in this case, it is a stuffed corn tortilla (thicker than I’m used to) with seasoned chicken, mozzarella cheese, and beans. There seems to be a wide variety of how the se are prepared, so it could be completely different wherever you live. You can either cook these in the frying pan or in the oven, so I chose to use the toaster oven. I have to say, the flavor is excellent. The corn shell is crispy on the outside and smooth (sometimes grainy) on the inside. The chicken filling is not shredded, it’s more pulverized, but it is savory. Next, I tried in the frying pan. I mean, fried is always better, right? And it was good that way, too. I think this would be great as a side or as a snack, but not as a meal. You can learn more about Tres Pupusas (they have 5 different flavors, and some of them are vegetarian-friendly) on their website at http://trespupusas.com/. Cooked in the toaster oven. Finally. Cold cuts that actually say they are gluten-free, right on the package. Yay! And keep in mind, I have coldcutslimeophobia. YES, that is a REAL thing! And that means if the cold cuts are the least bit slimy or sweaty or what-have-you, they turn my stomach and then go in the trash. So when I tried this Oscar Mayer Delifresh Honey Smoked Turkey Breast, I was not only pleasantly surprised, but extremely pleased. They’re not filled with gristle or fatty pockets. They have excellent texture and flavor, and they keep in the fridge for a surprisingly long time after you’ve opened them. Much longer than cold cuts you get at the deli counter. Those are usually over the top of my slime-meter within three days. Thank you, Costco, for this delightful chicken salad. (I found it at Costco, not sure where else it might be available.) It’s chock full of high-quality white meat chicken, and is conveniently packaged into eight single-serving cups so they’re easy to take along on picnics or travel, and there’s no measuring for portions if you’re on a diet. I normally don’t eat food with almonds in it (salicylate sensitivity), but this is too good to pass up. It’s clearly marked on the packaging that it’s gluten-free, too. So yay for that! The taste? Well, the cranberries are not bitter (they’re prepared with sugar…), and the celery seems slightly pickled – and sweet. I’d definitely consider this on the SWEET side. If you like that kind of thing, then this is for you. But, can chicken salad be healthy with all that mayonnaise? Good Foods doesn’t use mayonnaise – they use low-fat Greek yogurt. One four ounce serving-size cup contains 140 calories, 4g fat, 12 carbs, 1g fiber, and 14g of protein. Not too shabby. And, it’s affordable, too. I am pretty sure the last time I purchased it, it went for $9.99 for all 8 servings. If I know I’m going to have a particularly busy week, I’ll buy a package of these and put them in the fridge so I can grab a quick lunch that is as complicated as putting lettuce on a plate and opening one of these cups. Pretty easy. Gooey strings of cheese follow your fork as you break off each piece. Fantastic consistency – not rubbery, sweaty egg like some gluten-free quiches, but more thick and hearty. And that’s even after it sat overnight and I microwaved it for 60 seconds. As you all know by now, I’m not a fan of peppers, but this had just the right amount of red peppers to complement the flavor, so I didn’t even pick them out. I know, crazy, right? And the artichoke hearts added such a lovely flavor. Unlike so many gluten-free quiches, this one holds together so well (yes, and has a flaky, delicious crust that holds together, too), that you can pick it up with one hand and eat it. I’m amazed. That crust was really awesome. I’d love to try it underneath some pumpkin pie (hint, hint). Another awesome creation by Cole’s Fine Foods. If you don’t live in Spokane, see if they’ll ship one of these babies to you. You’ll love it. Blake’s wins the gluten-free comfort food crown as far as I’m concerned. Their chicken pot pie (which I review later) is amazing, and their shepherd’s pie is hearty, delicious, and oh-so satisfying. After cooking for 15 minutes in a 475 oven. After tasting the cheese quesadillas daiya offered at the Gluten-free and Allergy Friendly Expo, I had high hopes for their pizza. So, I went out and purchased a Mushroom & Roasted Garlic “with gourmet ingredients” gluten-free pizza. Now, I’m a big fan of dairy, but I have some friends who aren’t, so I figured I’d give this a try to see if it was any good. At $7.50 for a pizza that, in my humble opinion, offers two servings (they say three on the package, but I beg to differ), I can’t recommend this to people who CAN eat dairy. If you don’t have a dairy restriction, I highly recommend the Sabatasso’s Pizza from Costco. If you don’t have a Costco membership, then I recommend the Freschetta’s Gluten-Free, which you should be able to find anywhere. Trust me, I’ve tried a lot of gluten-free pizza. Well, this was surprising. 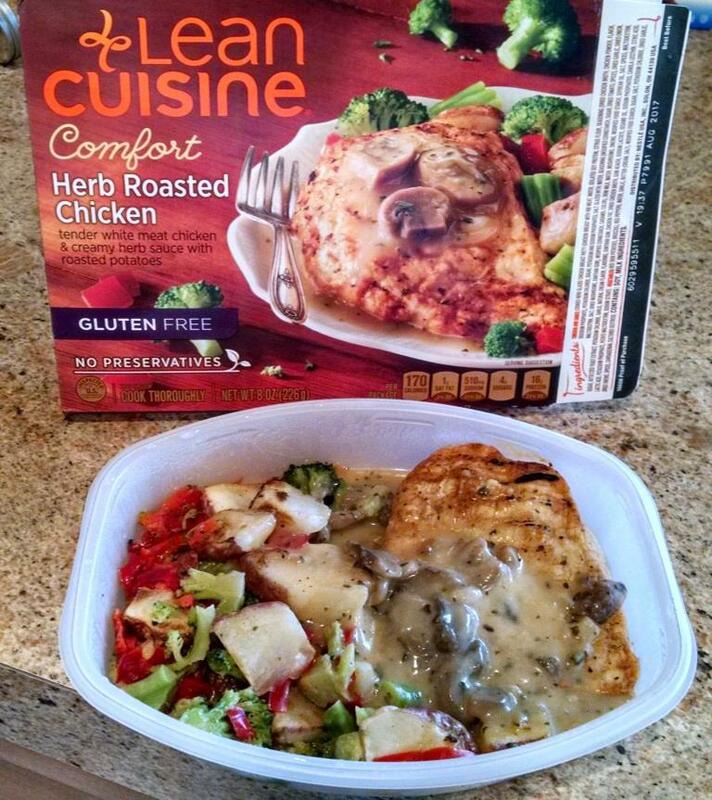 After cooking this meal in Lean Cuisine’s “Comfort” food series for 6.5 minutes on high, I was expecting rubber. Not so. The chicken was a large piece of white meat breast – and you could even tell by looking at it that’s what it was. The sauce on it was a light, yet savory, cream of mushroom style with real mushrooms in it. I’m not sure where they get “herb roasted.” Maybe it was, but I couldn’t taste them. The mushroom sauce complemented it nicely, so I didn’t miss the herb flavors. The red potatoes in fact had their skin on and were very tender. The broccoli was just a hair overdone (I like it really well cooked anyway, but if you like it crispy, forget about it), and those veggies were inundated with red peppers. Why??? The outside edges of the chicken were a little tough, but it was cooked in a microwave, so what do you expect? The consistency isn’t horrible by any means, but it certainly doesn’t have the pull-apart moistness of a fresh-roasted chicken. But what do you want for $1.88 on sale? ONLY 170 calories; 4g fat; 510mg sodium; 18g carbs; 16g protein. Despite the fact that red peppers were fused via nuking to a couple of the potatoes, this one’s a winner in my book.